Tonight, at UC’s Zellerbach Hall, will be another world-famous musician of our time. 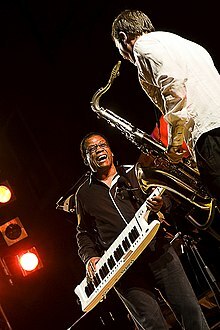 One of the music greats of this era is Herbie Hancock. He has made a name for himself in American music as a pianist, bandleader and composer. He is credited with being one of the primary architects of the “post-bop” sound. Perhaps even more interesting, he is one of the first jazz musicians to embrace music synthesizers and funk music. Funk music is characterized by syncopated drum beats. Hancock’s music has also been called melodic with many “cross over” songs. His music uses funk and soul with a freer use of jazz based stylistics. He has uniquely blended jazz, blues, and modern classical music in the Debussy and Ravel styles. His best known works are “Cantaloupe Island”, “Watermelon Man”, “Maiden Voyage”, “Chameleon”, and “Rocket.” He won the 2008 Grammy Award for Album of the Year. only the second jazz album to win the award (after Getz/Gilberto in 1965). Among other awards, Hancock was named UNESCO Goodwill Ambassador for the promotion of Intercultural Dialogue. He practices Buddhism from the Nichiren school of Mahayana Buddhism. He was born in Chicago and began his musical education in classical music. At age eleven, he played with the Chicago Symphony, Mozart’s Piano Concerto No. 5. Through his teen years and beyond, he never had a jazz teacher. He began working with jazz musicians when he attended Grinnell College. During this period, he was influenced by Donald Byrd, Coleman Hawkins, Oliver Nelson, and Phil Woods. He recorded his first solo album in 1962. His “Takin’ Off” caught the eye and ear of Miles Davis. So, in 1963, he joined Miles Davis’ “second great quintet”. During this phase, Hancock found new ways to use common chords, while also employing and popularizing chords that had not been used in jazz previously. This created unorthodox and sophisticated chord changes that were hardly discernible. He also recorded dozens of albums in his own name, as well as a sideman for Grant Green, Bobby Hutcherson, Donald Byrd, and Freddie Hubbard, among others. His most influential jazz LPs of the Sixties were Empyrean Isles (1964) and Maiden Voyage (1965). Perhaps I was listening to his jazz when I reached UC Berkeley during the 1964 to 1965 time frame. Later, he began incorporating rock and popular music into his recordings. He also began doubling on the Fender Rhodes electric piano at the suggestion of Miles Davis himself. After being dismissed from Davis’ band in 1968, he formed his own sextet, though he still appeared on Davis’ records over the years. Hancock became fascinated with musical gadgets and toys in the 70s. He composed the soundtrack for Bill Cosby’s Fat Albert and signed on with Warner Bros. Records. He founded a sextet to encompass electronic music with Dr. Patrick Gleeson programming the synthesizers. More albums were released using the Fender Rhodes piano, along with the ARP Odyssey, ARP 2600, ARP Pro Soloist Synthesizer, a Mellotron, and the Moog Synthesizer III. Hancock was involved in various bands, including his “V.S.O.P.” quintet, that included the Miles Davis quintet, except Davis. In 1978, he recorded an album with Chick Corea, who had replaced him in the Davis band. He albums reflected jazz-inflected disco and pop music during this period. Into the 80s, he also wrote traditional jazz pieces. In 1983, he won a Grammy for the instrumental single, “Rockit.” He appeared onstage at the Grammy Awards with Stevie Wonder, Howard Jones, and Thomas Dolby. Into the 90s, he recorded “A Tribute to Miles Davis”, released in 1994 and won a Grammy for best group album. He continued to collaborate with other jazz musicians during the 90s. Recently in 2005, he recorded duets with Carlos Santana, Paul Simon, John Mayer, Sting, Annie Lennox, and Christina Aguilera, among others. He continues to perform and collaborate with famous singers and musicians. He has won 14 Grammies, one Academy Award, 5 MTV Awards, and the 1997 Miles Davis Award. Is this my first Herbie concert? I honestly do not remember. So many jazz greats appeared at the Concord Jazz Fest over the years, even when it was held in the park, rather than the Concord Pavilion. Give Me A Coors, Field! Any baseball park named after a beer must be a six-pack of fun. The Colorado Rockies started their expansion team existence playing in old Mile High Stadium, prior home of the NFL Denver Broncos for decades. Coors Field is another downtown stadium that ushered in a nice and healthy redevelopment of old downtowns across the country. Of course, the best is in San Francisco with ATT Park, home of the World Champs. Coors Field is adjacent to Denver’s Union Station, where I stopped on my Amtrak trip from Chicago. Coors Field opened in April 26, 1999 against the New York Mets. It quickly became the most prolific home run ballpark every built, due to the altitude of the city. The average score was 8-7, and no lead was ever safe. The ball travels 9% farther at mile high versus sea level. In general, the thinner air meant less curve or snap on a curve ball, with the fast ball gaining 6 inches of speed! Total cost to build the stadium was $300 million, with capacity around 51,000 fans. The Rockies drew over 4.5 million fans in their first season at Mile High Stadium. The original design set seating capacity at 43,800, but construction changes and additional seats in right field increased the capacity to 51,000. Center field is also known as the Rock Pile, where seats still only cost a dollar! Even better, construction workers found dinosaur fossils, including a 7 foot long triceratops skull, weighing a thousand pounds. Of particular interest at Coors Field is the Blue Moon Brewery located behind the right field stands. It is operated by Coors Brewing Company and experiments with craft beers on a small-scale. Among the food selections are sushi, Rocky Mountain oysters, Rocky Dogs, Dave’s ribs, pizza, sushi, pasta and the usual ballpark fare. The 1998 Major League All-Star game was held here. In 2002, the mighty New York Yankees visited for the first time. The short series was a slugfest with 70 runs scored. The Rockies appeared in the 2003 World Series against the Boston Red Sox. Games 3 and 4 were held here, with the Sox winning the world championship in game 4. The Rockies star shortstop, Troy Tulowitzki pulled off an unassisted triple play on April 29, 2007. I plan to attend two games here, Saturday evening, and Sunday afternoon. I hope to see plenty of other Giants’ fans here as well. It always looks so inviting when watching our hometown boys on the road, with the visiting stadium full of Giants fans in black and orange. I can only hope that the Giants are still in the pennant race. My hotel is walking distance from Coors Field. in front of the bar/disco are class guys. Marty is from Honolulu, and also works at Coach. The hotel is next to the 16th Street Mall, a stone’s throw from Larimer Square, and a 3 wood from Coors Field. And parking my car here was only $10!!!! There were a plethora, make that several plethoras of Giants fans here last night. We certainly cheered louder than the Rockies fans. On the field level, we were probably close to 50%. But the Rockies fans are pretty mellow, except for the young kids. The stadium is quite similar to ATT Park, but without the vibe of the Bay, the Bridge, and the crazy Giants fans. However, food seems to be much less here, with more generous portions. So, I am headed out to the finale of the four game series, hoping for a Giants sweep. The Giants are only 4.5 games behind the dreaded D-backs, though they might be closer to the wild card with Atlanta and St. Louis. And they let us buy drinks and food from street vendors outside the stadium, and carry it in!!!! Glory be, the American entrepreneurial spirit is alive and well in LoDo. Perhaps one of the unique and enjoyable little college towns is Boulder, home to the University of Colorado, and numerous athletes in training. I have had the good fortune to visit and stay many times in the past, primarily for business, but also for apres ski and to play tennis. It ranks up there with many of the cutest little college towns, and perhaps the most charming in the western United States. A bonus is the famous Pearl Street Mall, a magnet for students, shoppers, runners, cyclists, people watchers, and street performers. Outside Magazine rated Boulder the number one sports town in America. I would rank it almost as high as Queenstown, New Zealand. With the Rocky Mountains as a backyard, Boulder offers hiking, cycling, and climbing, along with skiing and boarding during the winter. Add the Boulder nightlife, and the reasons for never leaving Boulder after graduation come to light. Boulder has over 300 miles of hiking and cycling trails and 45,000 acres of open space. Add in hot air balloons, rafting or kayaking through the center of town, fly fishing, and golf. Sounds like paradise to me! Founded in 1858 by gold seekers, the Chautauqua came along in 1898. True to the nature of their founders and the spirit of the region, Boulder is often called, “The People’s Republic of Boulder.” The University of Colorado was founded in 1877, and likewise continued the spirit of free thinking with the nickname, “Athens of the West.” Recently, the Naropa Institute, founded by Tibetan Buddhists, opened in 1974, adding an even more progressive educational element to the Boulder scene. Boulder is also known for its cultural creativity as well. It was voted one of the Top 25 Small Cities for Art, but American Style magazine. Several national laboratories and high-tech companies have also moved into the area to tap the atmosphere of entrenuership, free-thinking, and innovation. Boulder is rather proud of their collective IQ! But for me, Boulder’s initial attraction was the college town party atmosphere, and plethora of energetic coeds ready to dance the night away. Places like the West End Tavern, Walnut Brewery, Bitter Bar, and Salt seem to come alive around 10 or 11pm. The place I remember from the 70s was Bananas, back then a rather hip and exotically decorated body bar or meat market. 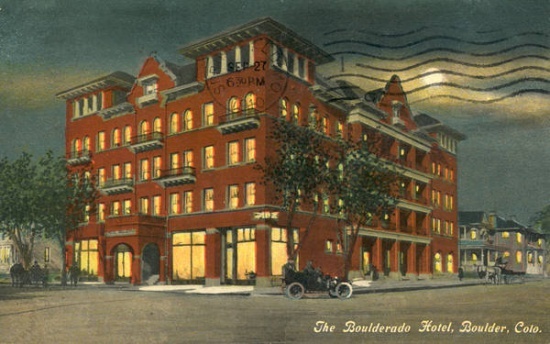 A must stay for Boulder is the famous and iconic Hotel Boulderado, founded in 1909. With a magnificent lobby, and 160 guest rooms, the Boulderado is in the heart of the downtown action. During business meetings there, it was so tempting to sneak out and just people watch on the Mall on a sunny afternoon. Of course, cocktail time on the Boulderado veranda was unmatched for viewing the activity below. Among its many famous guests were Robert Frost (my favorite poet), Helen Keller, Billy Sunday, Enos Mills, Franklin Roosevelt, and Ethel Barrymore. With a population around 100,00 people, Boulder and the University were prime attractions for the hippies of the 1960s. The Southern Arapahoe tribe wintered at the base of the Rocky Mountains near Boulder. Gold, silver, and coal mining brought the first wave of immigrants and settlers. I rest my case. You must visit next time you come out here to ski, hike, bike, or chill. My plane ride from Oak-town to Denver was short and sweet, as I was upgraded, and sat next to an Anthony look-alike. I drove to Boulder before checking into my hotel and strolled the 16th Street Mall. My hotel is way too hip for me. The Jet Hotel’s entire lobby is a bar with blaring DJ music, and a line of wanna-babes, and dudes standing in line to get in. Yours truly just walks up to Marty, the head honcho. He shakes my hand and lets me in. Eat your hearts out, you little hot hard bodies!!! 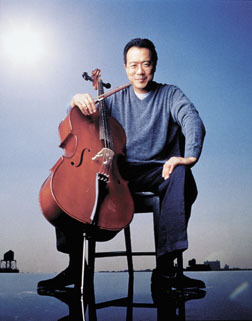 Mr. Ma is a French born American cellist, virtuoso, orchestral composer, and winner of multiple Grammies and the Presidential Medal of Freedom in 2011. He is without doubt, the most famous and well regarded cellist of our time. He was born in Paris in 1955 to Chinese parents. His mother was a singer, and his father a violinist and professor music. He began performing for audiences at the age of 5. He performed for Presidents Kennedy and Eisenhower at the age of 7! And of course, he attended the Julliard School of Medicine, as did the famous robber barren, Cosmo Kramer. He is a graduate of Harvard University. His list of accomplishments are too numerous to mention. His discography is even more impressive. This is a partial list, since they earned Grammy Awards. This is the 100th Anniversary of the San Francisco Symphony this year. The SF Symphony has invited the big five of symphony orchestras to help celebrate. These are the Boston Symphony, the Chicago Symphony, the Philadelphia Orchestra, the Cleveland Orchestra, and the New Yorn Philharmonic. They will perform two concerts apiece throughout the season at Davies Symphony Hall. Have you every been to Montalvo in Saratoga for a concert? It is probably the most intimate setting for a concert in the entire Bay Area. We were here a few years ago to hear Roger McGuinn of the Byrds in a solo concert. We got to meet his wife before the concert, and mingled casually with the other patrons with wine and refreshments before the concert. 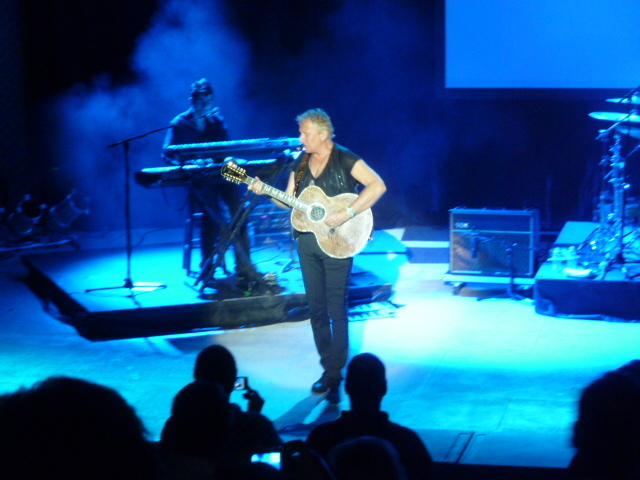 We are attending a concert by Air Supply, one of our favorite soft rock groups. The main players are Graham Russell,a left-handed guitarist, and Russell Hitchcock, the singer and songwriter. They had eight Top Ten hits in the US in the 1980s. They began their collaboration in Melbourne, Australia in 1975. They actually met in 1975 when they were performing Jesus Christ Superstar in May 1975. Chrissie Hammond and Hitchcock were on vocals, while Russell played the guitar. Hammond left to form Cheetah, and was replaced by Jeremy Paul. But even through the mid to late Seventies, Hitchcock and Russell were still poor. The reached the big time in 1981 with a number one hit, The One That You Love. It featured two other top ten hits, Here I Am, and Sweet Dreams. Their 1982 album, titled Now and Forever, continued their run of top tens with Even the Nights Are Better. In 1983, the produced their Greatest Hits album, with a new single, Making Love Out of Nothing At All. In 1984, their song, I Can’t Wait Forever was included in the movie Ghostbusters. The have continued to record and play concerts through the 90s and 2000s. In 2005, they became one of the first foreign bands to perform in Cuba. We have seen them perform twice before. First in Vegas at the Orleans Hotel and Casino where they rocked the house. The second time was at the Grove in Anaheim, where Russell went into the audience and nearly caused a riot! Add in some shopping on Santana Row, and an overnight stay in Silicon Valley, shabu shabu dinner with my son and his new GF. It was a rousing concert, as Russell actually went into the aisles and across the entire row of seats just two rows behind us. I tell you, it was the second coming of Elvis. Russell was sporting a wedding ring, meaning he must have tied the knot with his since we last saw them. They were hugging him like a pit bull on a poodle!!!! !